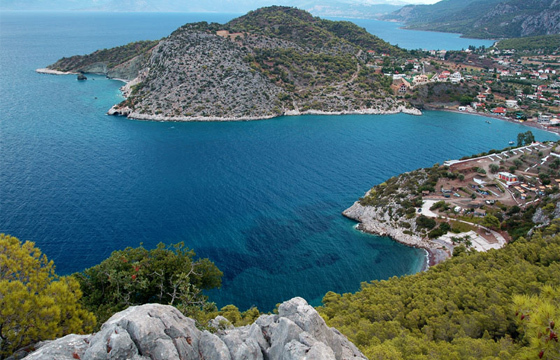 Nestled in a dazzling narrow inlet of the Corinth Bay, very close to the point where the Attica Prefecture ends and Corinthia begins, Schinos awaits demanding visitors who seek for the best: transparent azure waters, heavenly landscape, dolphins, sea turtles, and pine trees hanging over the sea. The area is ideal for fishing and also for boat explorations as it hosts caves, splendid bays and secluded beaches. Schinos beach also offers a lively beach bar, taverns and a small port.